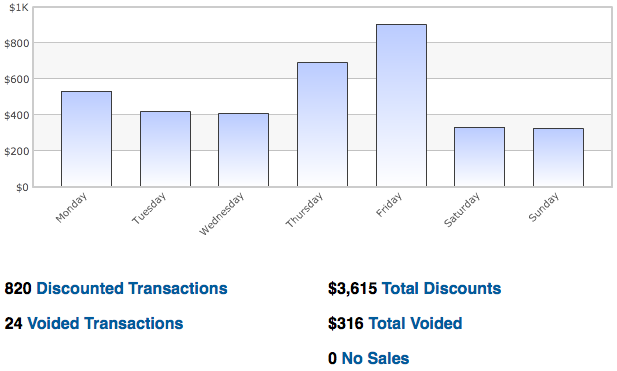 Lets you see the discounts + voids that are being used at your site. See below for specific reports. This report shows you how much discount is given at specific times during the day. This information can then be related to your promotions and turnover for a better understanding of how much you are ‘making/losing’ through your discounts and promotions. You can see above the peak discounting period is between 9.30-10pm. To see the individual discounts from this period click on the time link below the graph to see who gave the discounts out. The below report will be produced. As you can see all the discounting has been done by a certain staff member. You can drill down into each transaction by clicking on the blue time link. 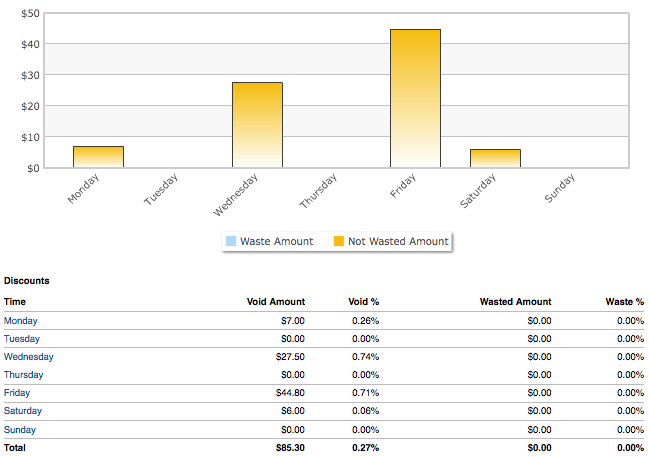 Discount types let you know exactly which types of discount your staff are using the most over the day, week or month. This helps you easily identify trends, for example you may find your Monday staff are discounting 40% more staff drinks than Tuesday staff, enabling you to ask questions as to the reasons. It’s always great if your staff know you are monitoring their behavior down to an individual transaction level. These reports enable you to see every voided transaction; the reason for it (staff are prompted in POS), and the staff and times the till is opened for no reason (No Sale). See the below example.